Presidential candidate of Ukraine showman Volodymyr Zelensky thanks the Ukrainian military for the support and protection of Ukraine, promises that he will return all prisoners to their homeland. "I want to thank every military serviceman for his support. You are real heroes for me and for every Ukrainian citizen, heroes not from films, not from books, but real heroes who protect the freedom and democracy of Ukraine ... I thank everyone - from Shyrokyne to Stanytsia Luhanska, every patriot," Zelensky said in a video address posted on his Facebook page. He expressed gratitude to all and assured that "we will bring you all back for sure." "... Our national guardsmen, our pilots, our sailors, our prisoners. 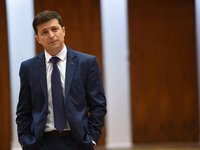 We will return them all for sure," Zelensky assured. The presidential candidate added: "I will not let you down."